Taking a slight departure from the fundraiser which was launched yesterday to help send me to Women in Secularism 2, I have noticed that the person who admitted vandalizing the Freedom From Religion Foundation’s (FFRF) holiday freethought banner placed on Public Square in Wilkes-Barre — Joe McDonald — recently organized a ‘Gun Appreciation Day’ event. 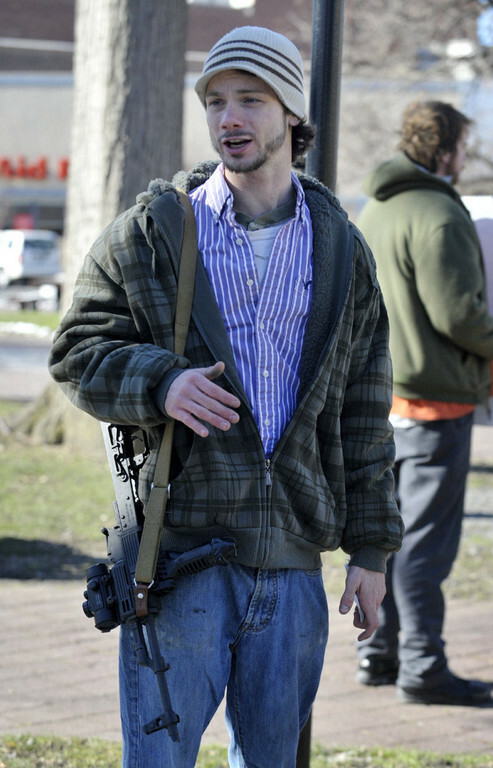 Within a video of the event (shown below), Joe is brandishing a civilian version of an AK-47 rifle and has some interesting ideas to offer – especially following his recent vandalism of the FFRF banner. To recap, I had — in working with the FFRF and receiving permission from the city of Wilkes-Barre following a $50 fee — brought a banner, slated to hang for one week, to city officials in December. One day after the banner — placed 30 feet high on a scaffolding structure — was erected, Joe McDonald, in broad daylight, climbed the structure, sliced ropes holding the banner, and had placed an American flag. This activity was videotaped by a local news station. Following the vandalism, McDonald spoke with media — admitting what he had done — and claimed that the Sandy Hook shootings were a motivation. I just think in the light of the elementary school massacre in Connecticut, that we shouldn’t be divided as a country over petty stuff like is there a God or isn’t there a God. From his actions, it appears to the be case, as a local talk radio show host noted in an interview with McDonald, that my freedom of speech was infringed upon by the actions of McDonald. If they could take away this second amendment, what’s to stop them from taking the first? It is interesting that Joe is concerned with the first amendment all of the sudden when he had, last month, infringed upon my free speech by committing vandalism and happily admitted doing so. I suppose the only free speech that matters is that of ‘God-fearing and gun-toting’ Christians? Joe also says, in this media report, that he is a “law-abiding citizen” although charges of disorderly conduct and criminal mischief — because of the banner vandalism — have recently been sent to Joe via postal mail. McDonald may either plead guilty and be immediately charged or plead not guilty and appear before a magistrate….and likely found guilty because of the damning evidence and his own admissions of vandalism. For more background pertaining to the FFRF banner placed in Wilkes-Barre, please read these related posts. McDonald is typical of so many gun “enthusiasts” who are so fearful of just about everything in the world that to feel safe they must cling to their bibles with one hand and grip their guns with the other. Reason and careful thought are foreign to these people. They see no contradiction in their attempts to deny freedom of speech to those who disagree with their religious beliefs while going to great lengths to protect those they perceive to be of importance. President Obama stated during his first campaign for presidency that people in NEPA “cling to their guns and religion”. McDonald is the perfect example of this observation, poster boy status. Aww how cute, he likes his right to bear arms but not your freedom of speech.